In December 2012, HP upped the ante again by providing a firmware update for the full range of existing StoreOnce appliances to further improve their performance. Perhaps the most visible evolution in deduplication is related to the subject of “where” the deduplication occurs -- deduplication can occur at the data source, backup server, and appliance allowing greater flexibility. 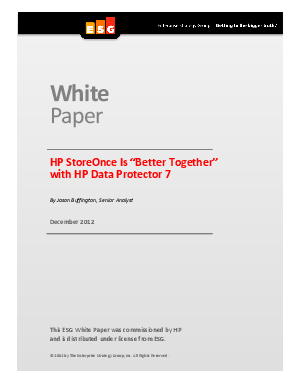 This paper looks at the benefits to be realized in the combined scenario of HP StoreOnce appliances being used with HP’s own Data Protector 7 backup software while considering the topic of “where” the deduplication occurs.